Now that Spring has finally come, we can't help but keep our eyes up at the trees watching the buds and dreaming of leaves. Meanwhile, it seems the rainstorms aren't ever going to let up as we sadly watch our barbeques go unused. 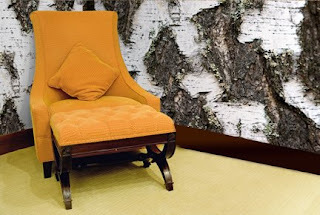 Perhaps this is why we chose to feature this custom wall mural design, birch tree bark texture behind a comfy chair, perfect for curling up and reading a book while waiting for Summer to finally take hold. Wood texture wall murals have a very serene, calming effect, but you can use many other natural textures for a custom wall mural. Bamboo always makes for a great custom wallpaper installation. Striated gemstones and rocks with layers of swirling color create incredible wall murals, very abstract and original. Natural patterns occur everywhere in unexpected places, and as busy people we tend to give these patterns only a moment of our attention. Create a wall mural and freeze that moment of beauty on your wall with a natural pattern wall mural from Great Wall Custom Coverings. I've read a few of your posts and really enjoyed your writing style! Because of your talent, I have just nominated you to receive the “When Life Gives You Lemons” blog award. Even if this is not your first award, please, come to my blog and claim your little bit of sunshine! Congratulations!